The Exorcism at the House of Monkton Falls is a worker movement game that is launching on Kickstarter April 13th. It was designed by David Tepfer and is being published by The Screaming Brain They took the time to answer some questions for us about their campaign. Take a look below and check out the campaign! The Exorcism at the House of Monkton Falls is a cartoonish horror worker movement game for 2-4 players age 10+, and takes 60-90 minutes to play. Something is terribly wrong with the rural town of Monkton, Vermont. A deep colorless fog has swept across the hillside, members of the community have gone missing, and once lush farmland is dying. Locals believe that an ancient spirit haunting the old manor house of the hill is to blame. And they’ve asked you and your team of paranormal investigators to check it out, and save the town! The Exorcism at the House of Monkton Falls is a cooperative board game for 2-4 players. Takes on the role of paranormal investigators an exorcise a powerful spirit from an ancient home in Monkton, VT. Explore the haunted manor, search for tools, complete tasks, and most importantly of all avoid the spirit and exorcise the house before dawn! When is your Kickstarter going live? April 13th 2018, which is Friday the 13th! 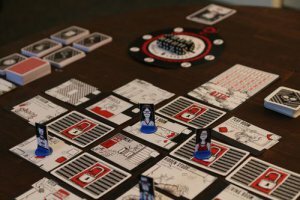 The game is currently in extended blind testing to complete the rule book but has already been through production samples with our manufacturer. The Exorcism at the House of Monkton Falls is comparable to Flash Point, a Coop version of Lords of Waterdeep, or Euro Betrayal at the House on the Hill. I love the horror genre. Horror movies scare me, but I love the unique way the horror genre tells stories. It was that style of storytelling I wanted to emulate on the tabletop. I found that many horror themed games are just that, Horror Themed” with no effort made to tell the story using mechanics. So, I wanted to make a horror game that did things differently. I started with a premise. Which was to make a cooperative horror game that could give players real feelings of dread and suspense. Once I knew what the emotional reaction I wanted for people playing Monkton Falls, I started to craft mechanics that would fit that goal. Monkton Falls is an incredibly thematic game, so each mechanic and design choice was to tailor a very specific thematic feel. And through development I worked through a “check system”. Each time I would make advancements in the design I would look back and make sure whatever change met the essential intent of the design. Cooperation! Monkton Falls is designed to be a game that can only be won through intensive communication and cooperation. We spent countless hours in testing to balance out the puzzle like nature of the game to the amount of in-game time players have to win. Consequently, wasted or misused actions could seal the groups fate. The decisions players make have to be made together otherwise players are sure to fail. Our biggest obstacle was balancing the difficulty level of The Exorcism at the House of Monkton Falls. Since cooperative games rely on a randomizer to determine what the game “does” it can be very tricky to balance for every given scenario while also creating the level of challenge I wanted for the players. Hand written slips of paper sleeved with old Magic the Gathering cards. Monkton Falls was originally fully card driven with no board. Ghosts were drawn from a deck and would attack players on each of their turns. Meanwhile, players tried to fend them off and complete tasks with tool cards from their backpack (hand). It was fun and a step in the right direction, but it was very one dimensional and random. I got into making games because I want more people playing games. Playing tabletop games has been a hobby for over 13 years. It wasn’t until a few years ago that I was actually open about it. I was often called a “closet gamer” by my gaming friends because I was so afraid of the stereotypes of being a gamer. I want to make games that are easy to learn and have themes that resonate in our larger pop culture. To bring people, who have shunned this hobby in the past, to table and ready to play. My company, The Screaming Brain, also produces a weekly blog and monthly podcast all about getting the most out of the board game hobby. We don’t do reviews or news. We focus on whatever we can do to get you into the hobby, or how to enrich your experience with tabletop games. Hello and Welcome to Engage! : A Family Gaming Podcast! This is episode 126. This week we are talking board games. Kickstarter Campaign of the Week: Fire in the Library! Fire in the Library is a press your luck board game that is currently live on Kickstarter. It was designed and is being published by Weird Giraffe Games. They took the time to answer some questions for us about their campaign. Take a look below and check out the campaign! It is currently funded and a copy of the game is only $24 shipped. 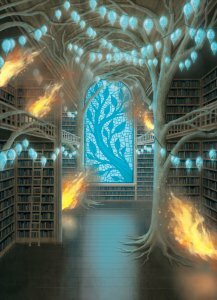 Players are heroic librarians rescuing books to accumulate knowledge and earn bravery all while avoiding the flames before the library collapses! Fire in the Library is easy to learn, simple enough for kids to play and enjoy. It has a depth and strategy that will keep serious gamers coming back. The game progresses with increasing Intensity. The books increase in value all the way until the end but no one knows who will take the last turn. Players must decide if they should save tools for an epic late game point swing or grab points now to take an early lead. Additionally there are alternate variants which include the ability to experience the excitement of Fire in the Library on your own with the solo game or spice up a multiplayer match by adding new challengers. History is burning—take chances, be brave, SAVE BOOKS! When did your Kickstarter go live? Fire in the Library is like Incan Gold or Can’t Stop, in that those are also press your luck games. I actually worked the development on this game, and I signed it because I really love the theme. The game is very thematic. I wouldn’t normally design a press your luck game, but this one is strategic and you can mitigate your luck, unlike the typical press your luck game. It has a depth to it that has kept me coming back for more! I have played this game repeatedly and I love it every time I play. I have a lot of ideas and there’s only so many that you can actually test out, so I have to go with the one I think will work the best and playtest. Initial design is usually writing down all my ideas for the game. From there, I try to go right to spreadsheets to determine what will be on the cards and other components. Having a spreadsheet and using nandeck means that once I start playtesting, I can figure out what works and what doesn’t and easily generate a new set of cards. Most of my design time is spent playtesting, as that’s when I ultimately find out what works, what doesn’t, and usually when I think of all my ideas. It’s easy to learn and kids can play and have fun with it. It also has a depth that adults and seasoned gamers will also love with a unique theme and a small price tag! The biggest obstacle was making sure that everything was really understandable, since games have to be able to be learned just from the rules and cards. The process of blind play-testing is always longer and more involved than I think it will be, but it’s all for the best, as I get to learn so much from each blind play-testing session. Initially I was told it was really easy, and it seemed like it’d be fun. Making games did turn out to be really fun, but definitely not as easy as I was told it would be! 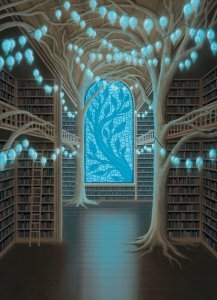 Fire in the Library will be on Kickstarter from March 19th until April 12th. If you want any other information, send me an email at contact@weirdgiraffegames.com. Kickstarter Campaign of the Week: Tacos vs Burritos! Taco vs Burrito by Hot Taco Enterprises is our Kickstarter Campaign of the week! No joke… this is a card game designed by a seven year old boy named Alex Butler. It is the ULTIMATE food fight on game night! Game play is straight forward. 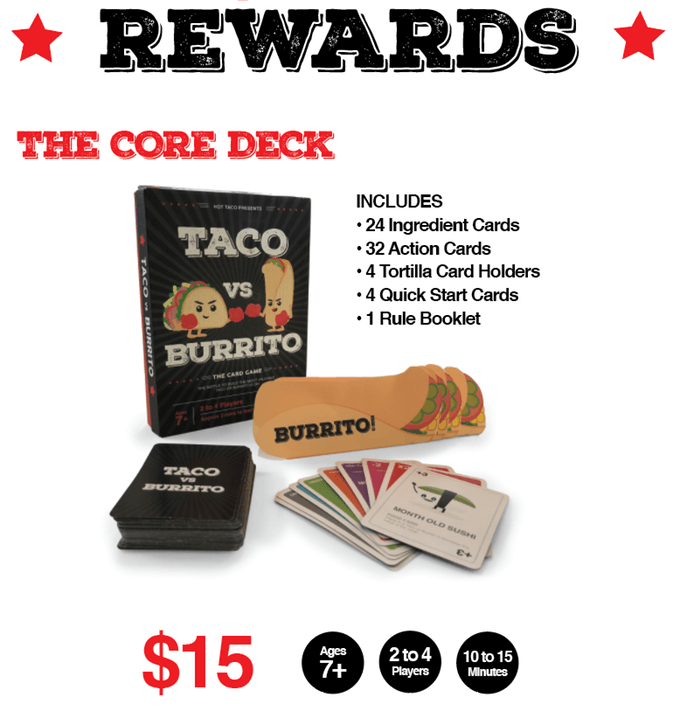 Players draw cards and add wacky foods to their taco or their burrito to earn points. The player with the most points at the end of the game wins. There are gotcha cards that can mess with your opponents strategy so it isn’t THAT simple. I think the theme is funny enough and the cards are cute enough to keep me interested regardless. I still can’t get over the fact that this game was designed by a 7 yr old. This kid is less than two years older than my daughter and he has already designed a successfully Kickstarted card game? That’s just crazy! I’m looking forward to playing this game just to see where this kid’s head was during design. Taco vs Burrito launched on Kickstarter with a modest goal and reached it in three hours! This is a cool looking filler game at a low price. Take a look at the campaign video below! If for nothing else… do it for the Taco costume! Kickstarter Campaign of the Week: Subatomic From Genius Games! Subatomic by Genius Games is our Kickstarter campaign of the week! Genius Games focuses on designing and publishing strategy games based on hard science concepts. They create learning tools that are genuinely fun. Subatomic is a deck building game themed around the intersection between particle physics and chemistry. Players start with a basic hand of Up Quarks, Down Quarks, and Particle/Wave Duality cards. Players will spend their turns combining those cards to form protons, neutrons, and electrons. They can then use THOSE resources to create elements or buy more powerful cards for their deck to help later in the game. The feature about this game that attracts me to it the most is the art. The Neutrons, Protons, and Electrons are all bursting with personality and all of the different cards use bright colors that help keep players engaged. Genius Games has been at this for a while. We interviewed John Coveyou (the lead designer and founder Genius Games on our podcast during the campaign for their last game Cytosis. It was awesome listening to the passion in John’s voice as he talked about the intersection between game design, hard science, and fun. The game will have an MSRP of $40, but backing the Kickstarter will net you an $11 discount. The campaign has already funded (at the time of this writing the campaign has $170,000 in funding on a $12,500 goal) so this amounts to a pre-order, but if it looks like a game you might be interested in, then be sure to back it. The campaign is coming to a close soon! New York Toy Fair 2018 Report: GameWright! GameWright Games was at New York Toy Fair this year, just like normal, and it was my pleasure to take a look at their 2018 games. Their full 2018 slate was there, with the sole exception of the cooperative game Forbidden Sky. I was treated to brief demos of most of their games this year. All of them are cute and many of them will do very well, but my attention was drawn to two specific games that I think you need to hear about. 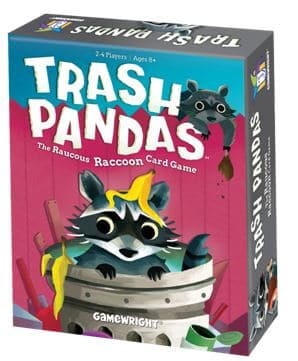 Trash Pandas is a push your luck card game where players take on the role of raccoons digging through a neighborhood’s trash. 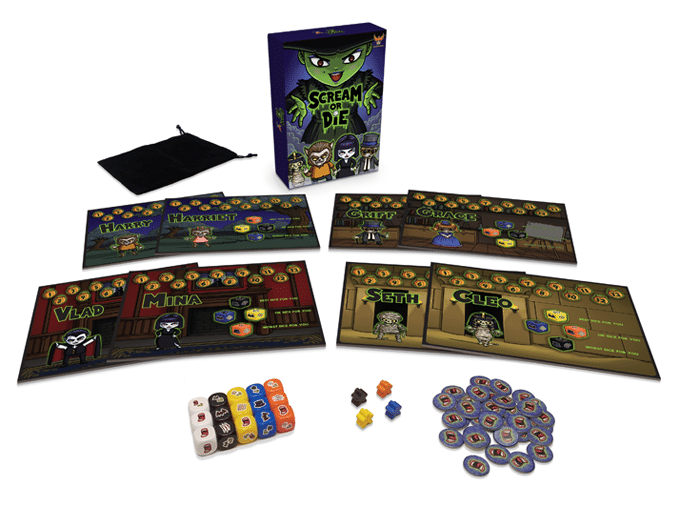 The first part of the game involves rolling dice in order to collect tokens that determine what actions are available. There are six tokens representing possible actions that you can take on an turn. You roll a die and claim the token that matches the symbol that comes up. At that point you can either move to the next phase and spend your tokens to take those actions or roll again to try to earn more tokens. If you roll a symbol that has already come up, then you bust and your turn is over. Taking actions will allow you to draw cards, bank them for points, or mess with your opponents. The game ends when the deck runs out of cards. This is a game that is firmly nestled in Internet meme culture. Trash pandas is a term for raccoons that showed up on Reddit. It has just been almost universally adopted by users across the Internet. Its funny, its vaguely descriptive, but most importantly, it gives you an idea of the sense of humor that this game is built around. It is juvenile, but not crass. This lighthearted fun is involved in every part of the game from the artwork all the way to the terminology used on them. It even influences the box art. Trash Pandas will be releasing sometime in early 2018 and we can’t wait to get our hands on it. Squirmish is a a card combat game that we reviewed before it was launched on Kickstarter several years ago. The highlights of the game at that point was its square cards, the quirky art design, and interesting combat. This is a new track for GameWright to take because normally they don’t focus on games that involve combat. 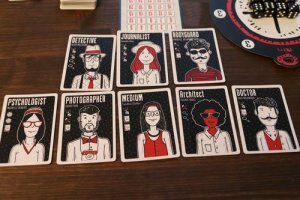 Instead, they favor games that focus on either cooperation or gentle competition.With that said, this game fits perfectly with GameWright’s other offerings by being lighthearted, silly, and fun. 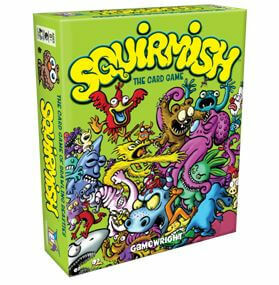 Combat in Squirmish involves playing square-shaped cards onto the table creating a spiraling battlefield that is referred to as a Squirmish (shocker. I know. ).We had our issues with the game initially before the game went to Kickstarter, but most of them were about game balance. GameWright has come through and smoothed out the design. They redesigned the game to make it faster and more aggressive. Squirmish will be released sometime in 2018 and we cannot wait to get our hands on this new and improved game. Keep your eye on EFG for more information. Cheese Quest is a game created by Phil Schadt with the art by Peter Gandia. It is for 2-4 players and is recommended for ages 9 and up. The gameplay is anticipated to take 45-60 minutes. The premise of the game is that you are in a house trying to navigate around the cats, the other mice, and the mouse traps to bring two pieces of cheese back to your nest. The game board is made from connected hex pieces referred to as room pieces, and provides a wide variation in the game board. There is a deck of action cards called “the pantry”. The cards can both help the player advance and act to undermine the goals of the other players. For example you can move a cat from one cat bed to another. The game also includes cat and trap tokens. The artwork is a darker cartoon aesthetic. It is reminiscent of the harder lines and more angular features in cartoons from the 80’s and 90’s. The graphics are not scary and they maintain a kid friendly look. On each turn there are five potential actions a player can take, but they can only complete three actions a turn (and are permitted to repeat an action). The actions include: move your mouse token one space, pick up a cheese token, draw any card from the pantry, play a card from your hand, and disable an obstacle on the board. Players need to balance advancing their mouse verses thwarting the efforts of the other players. From the Kickstarter information, this looks like a fun and relatively light strategy game that could be played as a whole family. The reading involved with the cards, game play option, and the strategy involved the recommendation for age nine and up seems quite appropriate. The game is on Kickstarter will end on October 11th. To get a copy of the game requires a pledge of $29. As of the time of this write up the game has $7166 pledged of their $12,000 goal and has 128 backers. With only a few days left of the Kickstarter campaign anyone interested needs to check it out before time runs out. For Avatar fans, the Legend of Korra series was a wonderful addition to the Avatar world. The Legend of Korra television series introduced a competition to the story, Pro-bending, and now it is a game! IDW Games has a Kickstarter for a two player sports game of Pro-Bending with miniatures based on the first season of the show. The game was created by Sen Foong-Lim and Jessey Wright. Each player controls a team with three benders: earth, fire, and water elements. The players are either the Fire Ferrets or the White Falls Wolfbats which are teams from season one of the show. The miniatures are highly detailed and add great flavor to the Avatar world. The game play includes elements of deck crafting and building and team customization. The objective of the game is to be on the other team’s side of the arena when the game ends or pushing all opponent’s benders off the back of the arena, which ends the end the game immediately. Each player has a strategy deck with different actions their characters can take. The deck is divided into three groups based on the element. Players can craft their strategy decks to customize plays during the course of the game. The strategy deck also includes two types of trick cards; very powerful moves that can be used once per game, and less powerful moves which may be used multiple times. However, with these less powerful moves require players to roll a referee die with each use. If you roll a fan you get a yellow fan token for “cheating”. If a bender receives 2 yellow fans they are out of the game. Exclusive, Limited Deluxe Edition Packaging. A limited edition championship promo-poster. 7 mystery expansion teams, totaling an additional 15 miniatures. 30 trick cards separated into 5 themed packs. Tricks are usable by all teams in the game. There is an Amon Expansion for an additional $30. The Legend of Korra: Pro-Bending Arena looks great for any fans of the Avatar universe. Act fast and check of the Kickstarter if you want the exclusives!